To better understand the accuracy of a forecast and set the ‘snap shot’ time series results presented previously into a more statistical long-term context, it is necessary to look at a particular measure of accuracy over time. 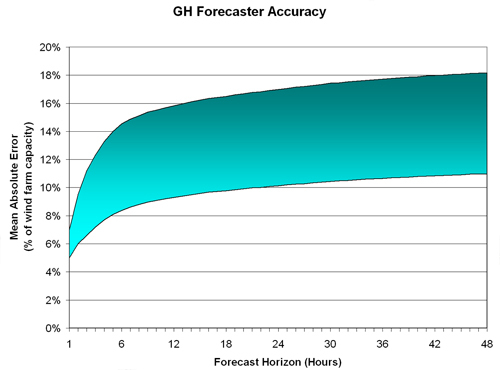 There are several different measures that can be used, but a commonly used measure is to present the Mean Absolute Error of the forecast, normalised by the rated capacity of the wind farm, against forecast horizon. Forecast accuracy is discussed further in Madsen et al (2005). The accuracy achieved is, of course, dependent on the specifics of the wind regime and the complexity of the site, as well as the country where the wind farm is located. An example of the typical range of accuracies achieved by state-of-the-art forecasting methods is presented in Figure I.2.15.